If your legs aren’t as stable as they used to be, stairs can make you feel like a prisoner in your own home. Every time you walk up or down a staircase, there’s a constant fear of falling and getting injured. That fear isn’t unfounded, either. Among seniors aged 65 or older, one out of every three experience a fall each year. Are Stair Lifts Right For Me? Sprains, head injuries, broken bones, and hip fractures are often the result of falling down the stairs. Even if you’re lucky enough to escape major injury, the experience alone can make you feel more afraid, depressed, and less active at home. Reducing the risk of falling is one of the best ways you can stay healthy and independent in your golden age. And a good way to do that is getting a stair lift for your home. Think of them as your own personal elevator. They’re designed to eliminate any concerns that an elderly or disabled person may have when navigating stairs. All you have to do is sit down, buckle up, and let the lift take care of the rest. Since staircases come in different lengths, shapes, and sizes, almost all stair lifts are custom made for the user’s home. They also have several built-in safety features to ensure that, once installed, the chair lift will operate as smoothly and as safely as possible. 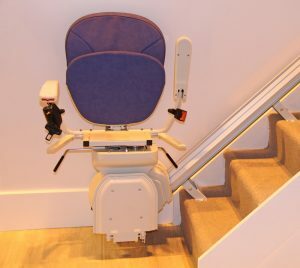 How Can I Get A Stair Lift Installed? Convenience and peace of mind are part of having a lift. The same goes for the installation process as well. And it all begins with a simple phone call. Your home and your needs are unique. Even if you’re just thinking about getting a stair lift, it’s a good idea to talk to a consultant one on one. You’ll be asked about your staircase and a few other things to help them understand how they can help you. If you need more detailed information, you should schedule a visit to your home for free. Once there, our consultant will take detailed measurements of your staircase, assess what kind of rail to use, and see if any other preparations are necessary to install a stair lift. When they have all the information they need, you’ll be presented with the different stair lift models suitable for your home. You can also choose different options such as color and upholstery to make sure that it matches your interior design. After all the details are ironed out, our consultant can then provide an accurate quote for the stair lift and its installation. At this point, there’s no obligation for you to pay anything at all. Feel free to research other options to make sure you find one that’s right for you. Whenever you decide to proceed, we can go ahead and schedule it on a date that’s most convenient for you. When that day arrives, your lift can be installed in just a couple of hours. From the railings to the actual chair lift for your stairs, each component will be prepared and set up by our professional installation team. And don’t worry, they’ll also make sure to clean up after themselves. After they’re done, the team will show you how to operate the stair lift. From using all the features to the proper safety precautions, they will walk you through everything you need to know. In fact, the team won’t leave until you’re fully confident to use it on your own. With your new stair lift, rediscover the joy of being able to go anywhere in the house. You no longer need to be confined to just part of your property. Leave something in the bedroom? Going back up to get it won’t be a problem. Being out of breath will be a thing of the past with our stair lifts for seniors. Preserve your independence and enjoy a safe and comfortable life in the home you worked so hard for. If that sounds good to you, take the first step. Call us now at 1-877-699-747 for a free consultation. We know your independence is very important to you and that is one of the reasons why we take pride in providing you high quality stair lifts. Call us to talk about your project and discuss how we can help ease the burden of the stairs. Enjoy living your life again, without the struggle of climbing up and down the stairs all day. Now's the Time to Give Us A Call and Begin Living Again!